Joy of joys the Toby Carvery has been replaced with an up-market steak house, Miller & Carter. Gone is the perpetual roast dinner – these have been replaced with succulent prime steaks that have been aged for at least 30 days. The décor has changed too. Although it is a large restaurant, the designers have created a series of rooms that give the impression of a much more intimate space. It is smart and modern and most importantly, all members of staff have been properly trained and can advise on all the menu so you can be sure to get exactly the steak that you prefer – cooked to your specification. Our visit coincided with us entertaining our goddaughter, which was perfect as otherwise we would have been arguing over which steak to choose. My preferred cut is the fillet – very tender but some would say lacking in flavour. Simon, my husband has always loved the variety provided by a T bone with its fillet on one side of the bone and a sirloin on the other. But my main reason for wanting to eat here was the advertised Chateaubriand which would be perfect for two to share. Classically, Chateaubriand referred to the dish rather than the cut of steak. Online research tells me that it is named after a 19th century French aristocrat named François-René de Chateaubriand whose chef is said to have invented it. Cut from the thickest part of the beef tenderloin, this is the long tapering muscle found directly on the lower two sides of the animal’s spine, it is large enough to serve two to three people. The perfect accompaniment to a Chateaubriand is in my opinion, a Béarnaise sauce; the mixture of egg yolks, butter and tarragon give a slightly aniseed flavour that counterbalances the richness of the meat and of course provides a good dip for crisply deep fried chips. Miller & Carter certainly know about side orders too – parsley butter, onion loaf, a wedge of iceberg lettuce smothered in your choice of dressing, chips; these all come as standard before you even get stuck in to the extras on offer. Since we had avoided the starters – we must be learning – we topped up with a couple of sides of mac and cheese with lobster and spicy corn and smoked cheese fritters. If this all sounds pretty decadent then you’d be right – but this was a celebratory meal with aforementioned goddaughter. 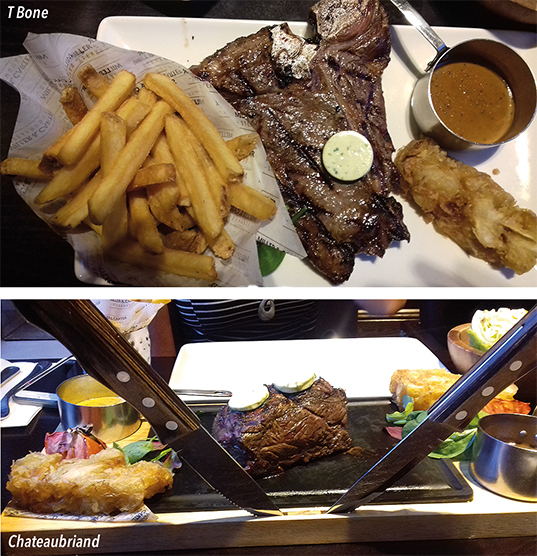 The steaks completely delivered on flavour and tenderness. Forkfuls of meat were passed around so that we could try everything and were unanimous in agreeing that starters would have been a step too far. The only extras were a couple of glasses of wine and beer and a rather unusual Seedlip Garden 108 cocktail which contained fresh peas. 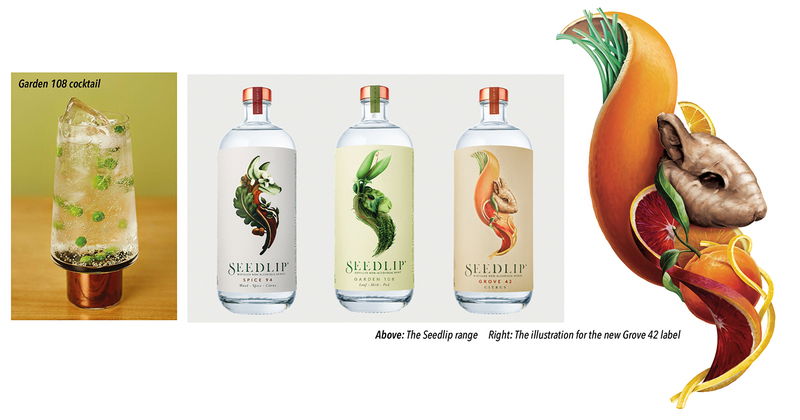 Seedlip is the world’s first non-alcoholic distilled spirit and comes in 3 distinctive flavours, Spice 94, Garden 108 and the latest Grove 42. So what prompted me to order such an unusual drink? Well I have to declare a vested interest in this innovative product – Simon, Bay’s very own illustrator and designer was the artist who created the squirrel on the label of the latest addition. Spice and the Garden versions – both have their own unique flavours and blend perfectly with the premium naturally flavoured tonic waters of Fever Tree – cheaper tonic waters are just too harsh. Serve in a large glass with the suggested accompaniments and you have a very grown up mock-tail. The Abergavenny Food Festival was created in 1999 by two local farmers who recognised the lack of consumer confidence in British produce following the BSE (bovine spongiform encephalopathy) crisis. They wanted to showcase the wonderful local produce available so held the first festival. In 2001 the difficulties for farmers worsened with the outbreak of Foot and Mouth disease. Undeterred, the festival organisers pushed on-ward and have gone on to create one of the highest profile food events in the UK. The festival has an exceptional reputation as a place for chefs, food businesses, farmers and food producers to come together. You will find product tastings, kids’ activities, masterclasses, cookery lessons and topical debates, along with many stalls selling everything associated with food and drink. Over the years, the festival has attracted television chefs and food heavyweights. This year among the many speakers are chef Jack Stein, son of Rick, chef Matt Tebbutt, Allan Jenkins, editor of the Observer Food Monthly, restaurant critic for the Guardian, Grace Dent and Spanish chef Jose Pizarro. Each year the festival attracts more than 30,000 visitors and generates an estimated £4 million for the local economy. Bay TRAVEL CLUB has a trip running to the festival on 15 September – at the time of going to press there were six places remaining. The tour includes luxury coach travel to and from Abergavenny with convenient pick-up and drop-off places, entry to the festival and a 3 course lunch at the renowned Angel Hotel. Cost £75 pp. If you would like to join us for this foodie festival call me on 01792 290486.